When Elle Crofton answered the phone for our interview, I could actually hear her smiling through the receiver. It’s not everyday that you’re able to hear and sense another person’s genuine positivity and joy from thousands of miles away through the telephone. After speaking to Elle for a few minutes, I wanted to know her secret. It seems like every time I scroll through my Facebook newsfeed I see another article with a title like, “10 Ways to Ensure a Happy Young Adult Life,” or “How to Survive Your 20s with Sanity,” that offers a one-size-fits-all survival strategy for this stage in life. Needless to say, these articles rarely provide any illuminating consolation. Yet after an hour-long phone conversation with Elle, I found more comfort in knowing that there really is no prescription for living life; Rather, Elle’s journey shows that attitude is everything. At 25, Elle was diagnosed with a rare blood cancer called Myelodysplastic Syndrome (MDS) which was treated with a daily pill. Elle remembers feeling like her normal self, still distanced from the reality of her cancer diagnosis. But once the pill stopped working, Elle awaited a stem cell donation. Following the donation, Elle underwent a 100 day isolation period in which her blood levels were closely monitored to ensure the success of the transfusion. Elle recently celebrated her last day of isolation (! ), and continues to document her experience in her blog, which Elle began as an efficient way to share information with friends and family. Since then, her blog has blossomed into a self-expressive outlet where she also shares some of her industrious hobbies like knitting and baking. With plans to work with children in the future, Elle has stayed connected to this goal by reviewing children’s books on another blog that she began with a friend. For Elle, blogging has been a great way to keep her mind active and engaged, while furthering her self-cultivation. Elle has a genuine and entirely humble way of speaking about her experience. Instead of viewing her MDS as a setback, Elle has embraced this time in her life as an opportunity to figure things out for herself, while getting healthy. As young adults, we put a lot of pressure on ourselves to determine every detail of our lives all at once. It can be difficult to be comfortable in the face of uncertainty, but Elle’s positive outlook allows her to plan for the future while enjoying the everyday moments, like watching a ton of Law & Order SVU with her mom on “hospital days,” and catching up with her friends. Elle offers some simple advice for caretakers and friends: be you! 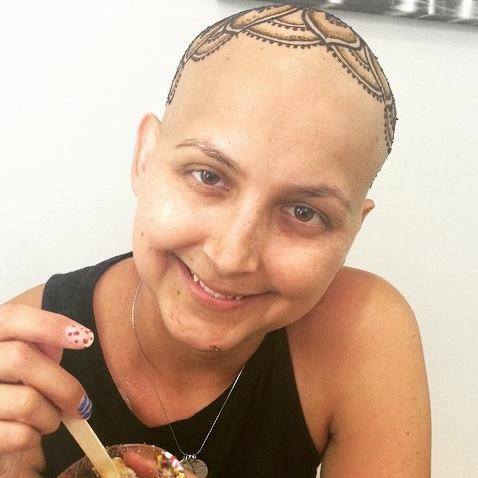 Elle leans on her network of family and friends and laughs as she tells me, “it’s really annoying that [cancer] happened” but it’s truly brought everyone closer together. In addition to continuing to write about her young adult cancer experience, Elle has become an advocate for informing young female cancer patients about their fertility options. Elle remarks, “Young women have to be their own advocates” when doctors fail to see the big picture. While doctors focused on eradicating her cancer, Elle had to ask about how various treatments would impact her fertility and her future. For this reason, Elle has partnered with a fertility oncologist at MD Anderson in Houston, Texas, where she is treated, to develop an online resource for women to learn more about their fertility options and the many available grants associated with such treatments. Elle has recently started an online graduate program for teaching, learning and curriculum through Drexel University. She might make her way back to the great city of Philadelphia sometime in the future, but until then, follow her journey on her blog. The title says it all.